NEXTECH® DFT Force Tester offers highfeatures, a wide range of digital force tester and are availablefor all testing requirements, with capacities starting from 5 N to2,500 N (0.5 to 250 Kg, 1.1 to 550 lbs). 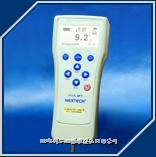 The DFT Force Tester arecompact, easy to use and measure both the load of tension andcompression. Units of measurement can be displayed with any units(lb, Kg, N) of measurement desired, by a buttons click. With anaccuracy of ±0.1%, DFT also has database, statistics, date/time,pass/fail, reverse display and backlight.